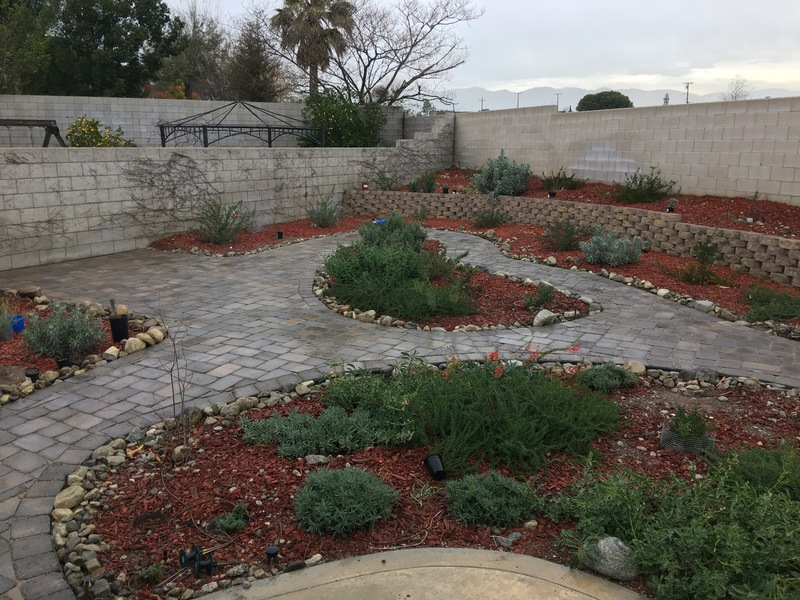 I was finally able to finish installing my paver patio and garden walkway. Much of the walkway and patio areas can be seen here. One of two paths leading from the house out to the garden. In some ways, I’m glad I was so inexperienced at installing pavers. I think that if I had known how much work was involved in making my pathways curved I would never have done it. But, straight paths would have looked so much worse. I really like how the path curves through the garden. It looks much more organic and informal, which matches everything else in the garden. Straight paths would have looked far too formal and organized. 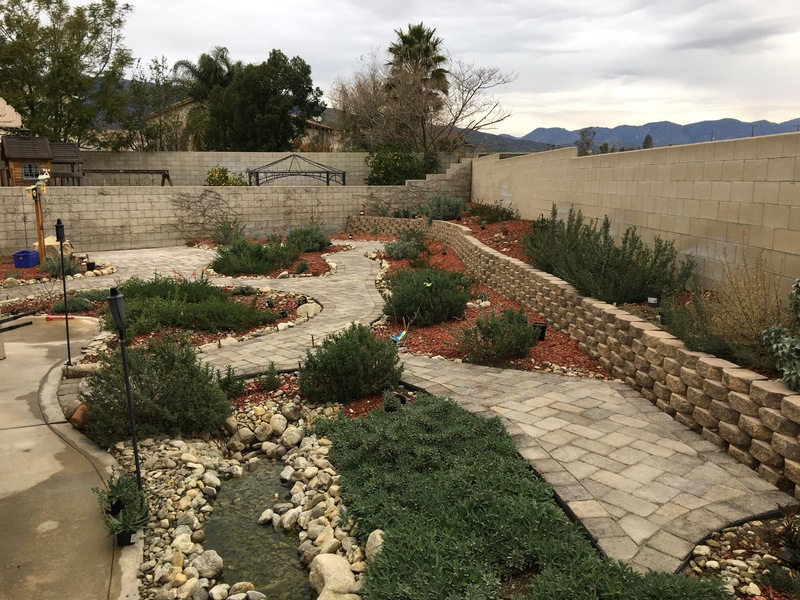 Almost all of the pavers I installed can be seen in this picture. There is still a lot of work to do. But, at least now the pathway and patio areas mean the garden and yard can be used by others. I have a little fire pit I got from Home Depot for the patio on the far side. A bench will go on the little patio by the stream. I’m really looking forward to being able to walk through the garden without getting mud or dirt on my shoes. Between the stones and hose guides, if I need to water (which shouldn’t be often), it should be so much easier now. And, above are a couple pictures of the pathway in progress, in case you’re interested. In some ways, it’s a very simple process. 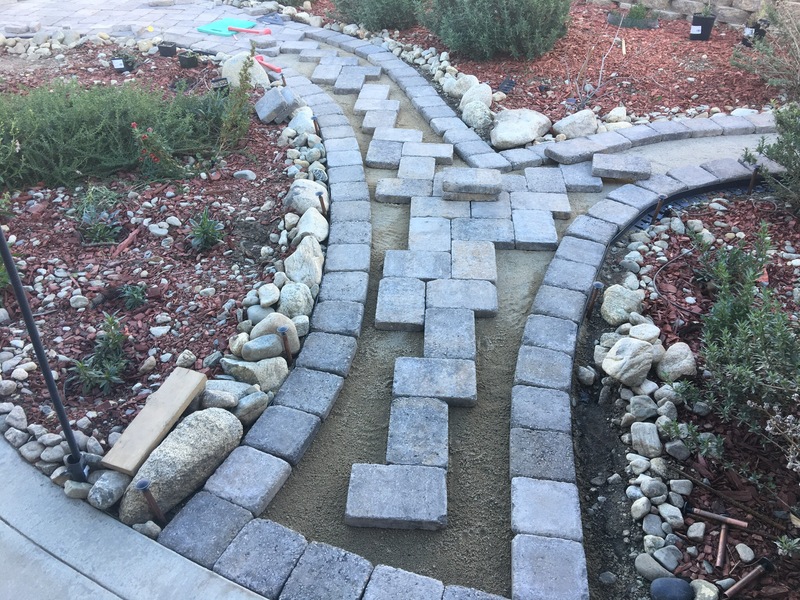 Level out the area, install edging, compact the ground, add a gravel base, if necessary (but if you read my previous post, you know why I skipped this step), add a sand base, level it, place pavers carefully (no dragging or sliding! ), cut pavers on the sides to fit as needed. I have no illusions about my skills, though. I am satisfied with how it came out. It looks good enough to me. However, I realize that a professional would probably tell me a variety of mistakes I made. My pattern is very irregular. Many of my cut pieces are poor fits. And, one thing I think that could be an issue that I didn’t foresee, is that I laid each block right against the other. There are little to no gaps between most of the pavers. I thought this a good thing but time will tell if I’m right. 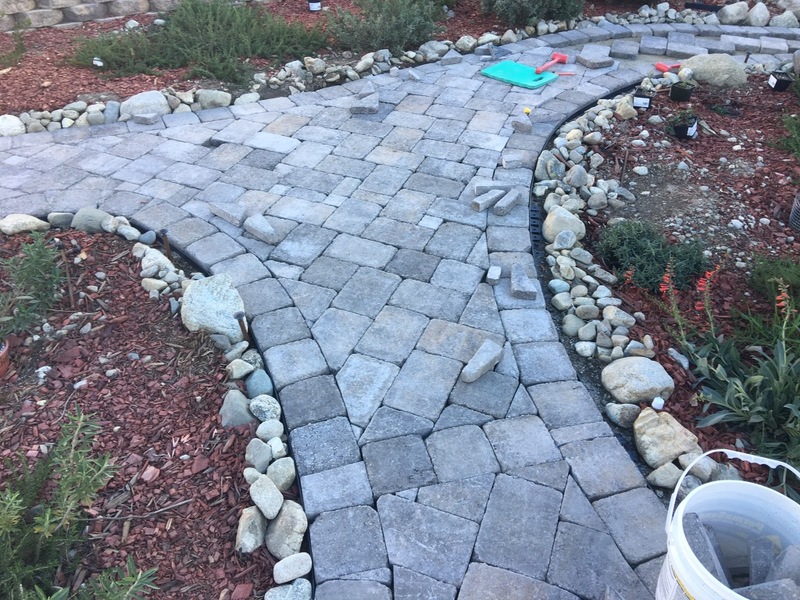 I feel like the right way to do it would have been to leave small gaps of 1/8th to 1/4th of an inch between each paver that would be filled with sand. This is how tiles with grout are done. I didn’t think that pavers were done that way. My final step was to use the PermaSand I bought (aka polymeric sand) and sweep it into the gaps. This was not an insignificant amount of work. The instructions said to make sure all of it was swept off the surface and then two sprinkle water on it so that it penetrates all the way down. This activates the polymer that eventually hardens. The packaging says it will hold the stones together and inhibit weed or insect activity. Otherwise, I could see ants burrowing upward or weeds growing. Maybe that will still happen, I tried following the directions but I will see if that works. My thinking was that pavers tight up against each other would be less likely to move around and would be stronger in the long run. But, if I’m wrong, I’ll just have to fix it somehow. 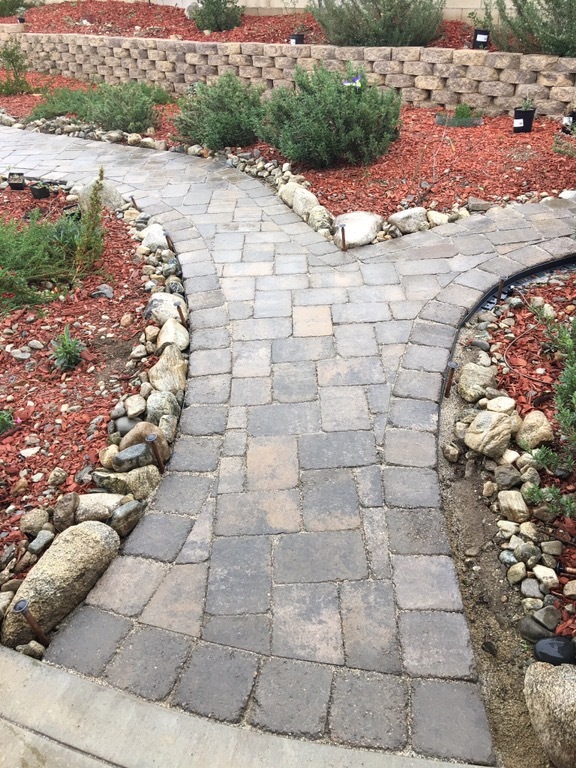 One reason I chose pavers over concrete was the ability to change it, if necessary. I imagine that making repairs or alterations would be far simpler with pavers instead of concrete. Ideally, I won’t have to make any changes at all, though. Dust was a serious issue on this project. I was unprepared for how much dust cutting the pavers created. I used an old miter saw with a diamond cutting blade to cut the pavers. It worked well enough. I had purchased a similar blade for my circular saw but found it more difficult to use. If I had known, I would have only bought the blade for the miter saw. I also got a grinding wheel for my angle grinder but I didn’t use that often, either. It took too long. The diamond blade on the miter saw chewed through stone after stone with relative ease. I have no idea how many I cut, but it must be in the hundreds. The curves required so many customized stones and that’s what really took the longest to complete the project. I also struggled with estimating how many stones I needed. In total, I used 576 of the square stones and 641 of the rectangular larger stones. My initial order was for 1 pallet of the squares and 1 pallet of the rectangles. That got me through the larger patio (for the fire pit area) and the first pathway leading from the house. Then, my wife helped me try to estimate how many I would need to finish. In my opinion, she did quite well. I ordered another pallet of the squares and two of the rectangles. Yesterday, I went to Home Depot twice. I bought 40 more rectangles the first time and then 25 the second time. That got me to the end. Whew! It’s hard to tell how many you need with irregular shaped areas and all the curving paths. I think getting within 60 is pretty amazing. I I had been able to order all of them at once, I might have saved about $100, maybe more. I’m not sure. Ordering more of the blocks at once lowers the prices. The rectangular blocks cost $1.98 each and the squares were $1.31 each. But, in bulk, they are $1.78 and $1.18 each respectively. But, I did the best I could. Maybe I could have gotten one of those measuring devices with a wheel to find out exactly how much path and patio I had in length and then try to average out the width and then calculate the area and add 10% for waste but I’m not positive that would have gotten me closer. So, I guess I paid an “inexperience tax” or something. I’m glad it’s done, though. As soon as the skies are clear, I’m going to get my telescope out and see if I can observe the Orion Nebula. It will be nice not to have to set up in the dirt. And, maybe the kids and I will have a little fire outside tonight. It should be fine to walk upon tonight.